This media resources page provides members of the media with information; resources; and broadcast-, print-, and web-quality imagery developed during the Windows to the Deep 2018: Exploration of the Southeast U.S. Continental Margin expedition. From June 13 - July 2, NOAA and partners will conduct an ocean exploration expedition on NOAA Ship Okeanos Explorer to collect critical baseline information about unknown and poorly known deepwater areas of the Southeastern United States. The expedition begins in Charleston, South Carolina, and ends in Norfolk, Virginia. During the cruise, our at-sea and shore-based science teams will work together to map the seafloor and make deepwater scientific observations in these areas. Live video of remotely operated vehicle (ROV) dives can be viewed online in real time from June 14 - July 1. The ship will conduct 24-hour operations consisting of daytime ROV dives and overnight mapping operations, including during transit. Mapping and ROV dives with high-resolution visual surveys and limited sampling activities will focus on priority deepwater areas off the coast of the southeastern United States. Dive sites are expected to include deep-sea coral and sponge habitats, chemosynthetic communities, and maritime heritage sites. This expedition will contribute to foundational information in the region to catalyze further exploration, research, and management activities. This is the first NOAA Ship Okeanos Explorer expedition that will contribute to NOAA’s Atlantic Seafloor Partnership for Integrated Research and Exploration (ASPIRE), a major multi-year, multi-national collaborative ocean exploration field program focused on raising collective knowledge and understanding of the North Atlantic Ocean. The deepwater areas offshore Florida, Georgia, South Carolina, and North Carolina are some of the least-explored areas along the U.S. East Coast. Though the East Coast is home to millions of Americans and is experiencing some of the highest population growth rates in the U.S., the southeast U.S. continental margin has some of the largest gaps in high-resolution ocean mapping data on the East Coast and limited previous observations via ROVs. Exploratory missions, such as those conducted via NOAA Ship Okeanos Explorer, are necessary to expand our knowledge of unknown and poorly known deepwater areas and to provide data for decision makers. Why is This Work Important? The expedition involves a number of NOAA partners including the Office of Marine and Aviation Operations; the National Marine Fisheries Service’s Office of Habitat Conservation, the Deep Sea Coral and Research and Technology Program, and Southeast Fisheries Science Center; the National Ocean Service’s Office of National Marine Sanctuaries and National Centers for Coastal Ocean Science; the NESDIS National Centers for Environmental Information; and Office of Oceanic and Atmospheric Research's Office of Ocean Exploration and Research. Other partners include the South Atlantic Fisheries Management Council, Bureau of Ocean Energy Management, and the U.S. Geological Survey. The individuals listed below will primarily lead activities during the expedition. They will coordinate input from multiple scientists and managers participating from shore to plan dives and are several of the voices you hear on the live video feeds and the primary participants in outreach events. For a full list of our on-ship team, please visit this page. Dr. Cheryl Morrison is a Research Geneticist at the U.S. Geological Survey (USGS) Leetown Science Center in Kearneysville, West Virginia. She has always loved the ocean, from Maine tide pools to tropical coral reefs. She followed this passion through an undergraduate degree in Marine Biology from the University of North Carolina at Wilmington (1991), and a PhD from Florida State University in Biological Sciences (1997). Cheryl is interested in marine biodiversity and how diversity is generated and maintained by life history traits and physical oceanographic conditions that organisms experience. She has been studying cold water coral ecosystems for over a decade in the Gulf of Mexico and Atlantic and Pacific Oceans and has participated in 24 research cruises using submersibles and remotely operated vehicles (ROVs) to explore and characterize benthic habitats. 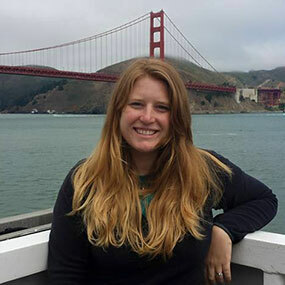 Her current research involves the utilization of genetic and genomic techniques to aid in the study of biodiversity, population, and community structure at vulnerable deep-sea habitats (deep-sea corals, cold seeps, and canyons). During the mission, she will be co-science lead, helping to guide ROV dives, providing narrative regarding the biology observed, and interacting with shore-based scientists. 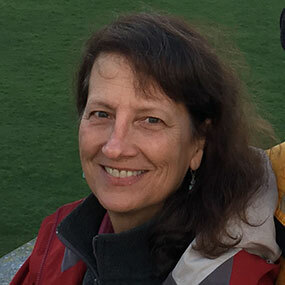 Leslie Sautter has been teaching marine geology at the College of Charleston for over two decades and has a background in paleoceanography as well as coastal research and geoscience education. She is founder and director of the BEnthic Acoustic Mapping and Survey (BEAMS) Program (http://oceanica.cofc.edu/beamsprogram ) which allows undergraduate students to conduct research using state-of-the-art seafloor mapping software. Leslie has been on many expeditions to study the seafloor geology and biota using ROVs and submersibles, and thoroughly enjoys taking students out to sea to provide experiential learning experiences. She continues to assist with development of education programming and web resources. 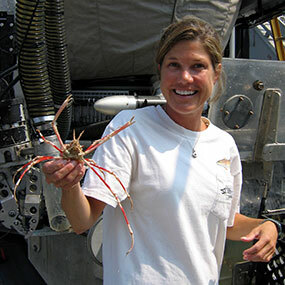 Kasey Cantwell is a Field Operations Specialist with NOAA's Office of Ocean Exploration and Research (OER). Kasey has a Master of Science degree in Marine Affairs and Policy and Marine Geology and Geophysics, and a Bachelor of Science degree in Marine Science and Biology, both from the University of Miami Rosenstiel School of Marine and Atmospheric Science. Kasey is responsible for coordinating telepresence-enabled expeditions conducted onboard NOAA Ship Okeanos Explorer. Since joining OER in 2012, she has coordinated over a dozen expeditions and projects, including multidisciplinary expeditions to the Atlantic submarine canyons, the Marianas, Pacific Remote Islands Marine National Monument, and Glacier Bay National Park. Beyond deep-sea exploration, Kasey’s background includes imagery-based mapping of coral reefs throughout the Caribbean, long-term ecosystem monitoring, and evaluating resource management strategies to improve efficiency and data quality. Derek Sowers holds a B.S. in Environmental Science from the University of New Hampshire and an M.S. in Marine Resource Management from Oregon State University. He has 14 years of previous coastal research and management experience, including work for NOAA's National Estuarine Research Reserve network and the Environmental Protection Agency's National Estuary Program in both Oregon and New Hampshire. 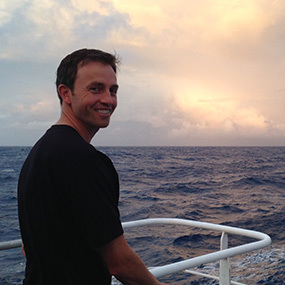 Derek has participated in ocean research expeditions in the Arctic Ocean, Gulf of Maine, Gulf of Mexico, Pacific Northwest continental shelf, North Atlantic Canyons, and New England Seamounts. During at-sea expeditions, Derek leads sonar data collection by planning the ship's mapping routes and producing maps of seafloor and water column features to guide exploration. On shore, Derek works at the Center for Coastal and Ocean Mapping/Joint Hydrographic Center at the University of New Hampshire to coordinate future mapping expeditions, process and archive data, and collaborate with other scientists. Derek is also a part-time Oceanography Ph.D. student focused on using Extended Continental Shelf and Okeanos Explorer data to develop marine ecological classification maps. B-roll footage is available here. Dive highlight videos, short video clips, and photos will be posted online as they are available. Please contact Katie Wagner for high-res footage, B-roll, and other materials at (301) 734-1008 or Katie.Wagner@noaa.gov. NOAA Ship Okeanos Explorer is the only federally funded U.S. ship dedicated to deep ocean exploration. The NOAA Office of Ocean Exploration and Research (OER) is coordinating the mission on the ship, which is operated by the NOAA Office of Marine and Aviation Operations. OER is the only federal program dedicated to exploring the ocean for the purpose of discovery and the advancement of knowledge. Anyone with an Internet connection can follow the expedition—LIVE. The same technology that allows scientists around the world to participate in the expedition from shore also enables interested members of the public to experience deep-sea exploration, the wonder of discovery, and the fascination of science in real time through the Internet. Mission logs, daily updates, and multimedia elements will be added to the website throughout the ROV leg to keep everyone informed. Wise management of ocean resources is critical, but we can't manage what we don't know—and that's why we explore. Even as the importance of deep areas of the ocean in our everyday lives continues to increase, our knowledge of these areas remains limited. In many instances, humans are “flying blind” when it comes to things such as regulation and resource use in deepwater areas. OER provides information from some of the most inaccessible parts of the ocean to scientists and resource managers. The publicly available ocean data and information gained from exploration expeditions gives resource managers the information they need to identify, understand, and manage ocean resources for the benefit of this and future generations of Americans. The ocean is important to our survival, yet remains poorly understood. America's future depends on understanding the ocean. We explore the ocean to make valuable scientific, economic, and cultural discoveries; we explore because ocean health and resilience are vital to our economy and to our lives. Data collected on NOAA Ship Okeanos Explorer are quality assured and then made quickly available to the scientists and the public. Collected data are used by scientists and resource managers to plan follow-on research, make management decisions, detect natural hazards, improve nautical charts, and more. Please see the Contact Us page for information regarding specific media, public, and government inquiries. June 14: Reddit "Ask Me Anything"